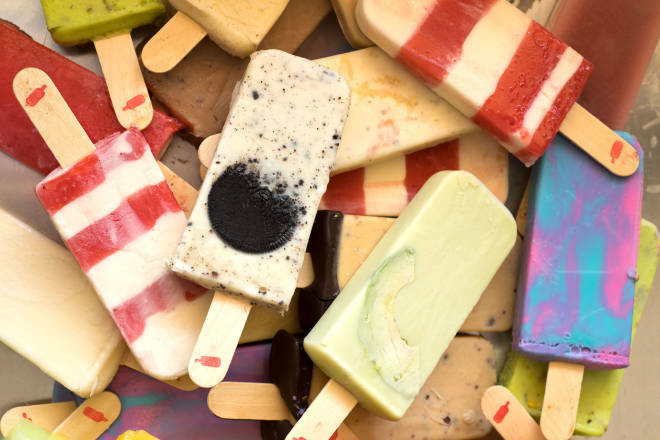 Above: ​An assortment of paletas from the Paleta Bar. Photographs by Douglas Merriam. There is no problem that ice cream can’t fix. I can’t remember where I recently saw that old adage—probably in one of the shops I’ve slurped my way through these past few weeks, but it strikes me that, as modern life grows more complicated, so does our need for simple solutions. Like two scoops in a cake cone. Lucky for us, freezer-case artists make it easier than ever to indulge in increasingly wild confections. In Albuquerque especially, ice cream shops court our taste buds and our Instagram accounts with photogenic, drool-inducing treats. They attract legions of devoted fans drawn to creative inventions and here-then-gone flavors. When I want blueberry-lavender gelato or a cup of vanilla churned to order, the Duke City is where I want to be. High-tech and hyper-local, this Green Jeans Farmery shop fast-freezes on-demand batches of ice cream with a blast of liquid nitrogen. Watch as your ice cream chef pours a bare minimum of ingredients into the bowl of a commercial mixer and opens a valve to add a blast of -321-degree liquid nitrogen, enveloping the mixer in a fog of vapor. The quick process means that, only a minute later, your scoop is ready to slurp. Because of the speed, fewer ice crystals have time to form, producing a super-smooth texture. Nitro Fog’s rotating menu of about a dozen flavors draws from ingredients produced by its neighbors in this hip container development (see “Industrial Evolution,” May 2017, nmmag.us/GreenJeans), such as a rum-cherry-pecan made with fruit soaked in Broken Trail rum, and a java chip starring cold-press coffee from Epiphany Espresso. Try the spiced dark chocolate, a subtle, not too sweet union of chocolate, cinnamon, mild red chile, and crunchy cacao nibs. This Northeast Heights newcomer takes Mexican paletas over the top, starting with feisty flavors and adding totally loco layers of dips and toppings. Imagine an intensely rich cheesecake bar dipped in milk chocolate, then topped with a Jenga pile of nuts, sprinkles, cookie crumbles, and cereal bits. Or, if you can, show some restraint and try one of the Spanish-accented offerings, like a pink strawberry bar (right) with a heart-shaped berry slice embedded on each side. Or an electric-yellow pineapple paleta studded with daring green rings of fresh jalapeño. The broad menu includes sorbet paletas, shakes, aguas frescas, and savory snacks. 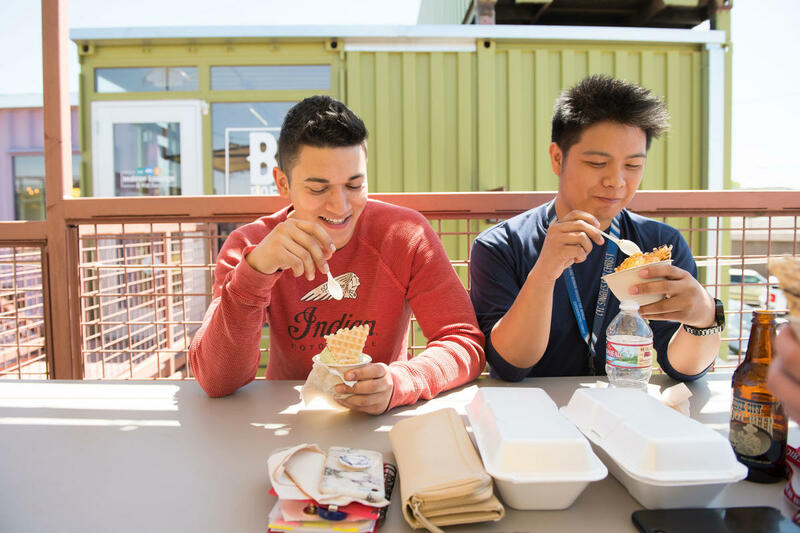 Above: Boys on the patio at Green Jeans Farmery, in Albuquerque, enjoying delicious treats from Nitro Fog Creamery. You may have already tasted some of the self-described “dangerously delicious” sweets from the Van Rixel Bros., the same guys behind the gorgeous truffles and addictive chile-chocolate bars sold under the Chocolate Cartel label. Swing by the small retail shop on Juan Tabo Boulevard and you can get a cup of luscious gelato or sorbet—or take a pint to go. Van Rixel transforms local Rasband Dairy milk into intensely flavored smoked-sea-salt-and-caramel gelato and crafts a miraculous, dairy-free Mayan-spiced cinnamon-chocolate sorbet with red chile and almonds. Look for Van Rixel’s pints and single-serving containers at Spur Line Supply Co., La Montañita Co-op, Whole Foods Markets, and Los Poblanos Farm Shop. Staying in? Order a triple-pint family pack and have it delivered by Uber Eats. Stop by this café at the National Hispanic Cultural Center just to try an ice cream taco, the Choco Taco of your youth served with South Valley street cred. Pick an ice cream flavor (I like the cinnamon-scented horchata) to be stuffed into a waffle-cone taco shell and topped with gobs of chocolate sauce and sprinkles. You will need two hands to hold this monster while your friend ’grams you gobbling it. Try the cucumber-chile-lime fruit paleta, vegan cookies-and-cream bar, or Vaca Roja float (vanilla ice cream and strawberry soda). You can also kick back with the grown-up bananas Foster boozy shake (vanilla ice cream, bananas, caramel, and Captain Morgan rum). In addition to sweets, the café serves a savory menu of burritos, sandwiches, and fun snacks, such as the Sonoran dog (a Nathan’s frank wrapped in bacon, topped with a zillion fixins), plus Frito pies and carne asada fries. Have fun experimenting with different kinds of chile. (Dried chipotle powder is also amazing.) Try garnishing with cacao nibs and/or toasted pecans. In a medium saucepan over medium heat, combine milk and cream and bring to a simmer. Remove from heat. In a large mixing bowl, whisk together egg yolks and sugar. Whisking constantly, pour in milk and cream in a steady stream. Pour the mixture back into the saucepan and cook, stirring constantly, until it thickens enough to coat the back of a spoon. Add chopped chocolate, salt, cinnamon, and chile powder and whisk until smooth. Pour into a glass or plastic container and chill 4 hours or overnight. Freeze in an ice cream maker according to manufacturer’s instructions. Albuquerque may lead the innovative ice cream scene, but these classic shops deserve a road trip. Above: Map by Michael Byers. An Arroyo Seco hangout since 1993, using local ingredients for flavors including piñon caramel, pistachio white chocolate, and pecan nougat (485 NM 150, Arroyo Seco, 575-776-5640, taoscow.com). Craft ice cream that’s familiar (vanilla, mint chip, chocolate sea salt), wildly imaginative (buttered popcorn, citrus basil, coconut miso, sweet corn), and always delish (101 W. Marcy, Santa Fe, 505-205-1595, lalecherianm.com). A downtown hangout with fine coffee and exceptional sorbet and gelato in grown-up flavors such as balsamic strawberry, blood orange, papaya lime, and rhubarb orange (128 E. Marcy St., Santa Fe, 505- 986-9778, eccogelato.com). Go for the pizza, stay for the gelato in flavors such as Almond Joy, rocky road, and cookies ’n’ cream (1209 N. NM 491, Gallup, 505-863-9201, fratellisbistro.com). Sumthins’ sundaes, floats, splits, and malts will cool you down after a dip in the hot springs (902 N. Date St., Truth or Consequences, 575-894-1040, sumthinsintorc.com). 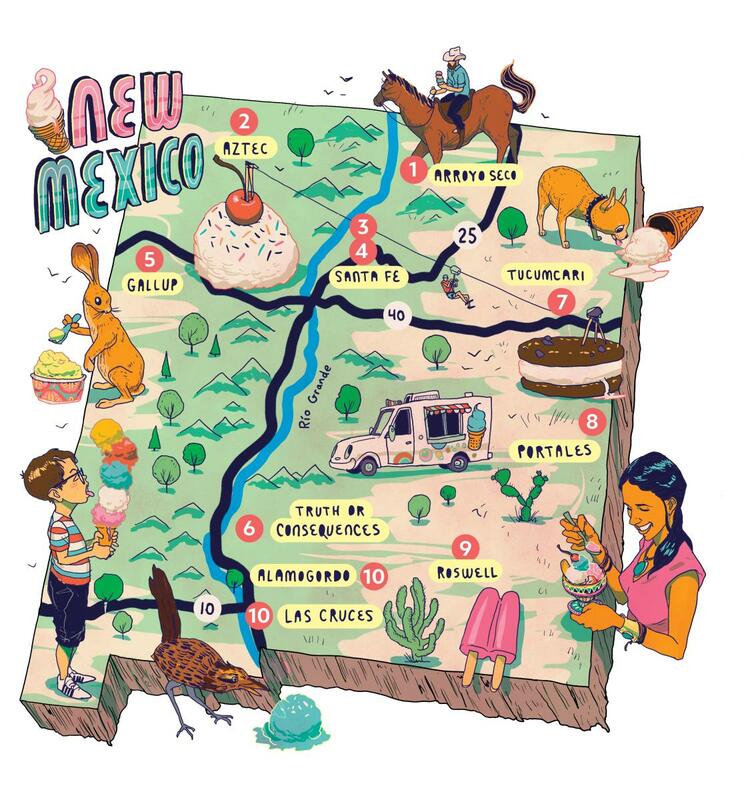 Don’t leave this Route 66 icon without a T-shirt (LICK ME ‘TIL ICE CREAM) and a green chile shake (1804 E. Route 66 Blvd., Tucumcari, 575-461-9647, on Facebook). A vintage Portales drive-up burger stand where the peanut butter shake is a must-try (100 N. Chicago Ave., Portales, 575-356-5841, pats-twin-cronnie.business.site). Do you have a favorite ice cream shop that we didn’t mention? Show us on Instagram @NewMexicoMag or on our Facebook page. Send an email to letters@nmmagazine.com.